Read the books that inspired the How to Train Your Dragon films. Hiccup has one last hurdle before the final battle can begin ...High up in the treacherous mists of the Murderous Mountains, Hiccup and the Company of the Dragonmark are in hiding. The witch's Spydragons are guarding the shores of Tomorrow - but Hiccup is determined to become King of the Wilderwest. 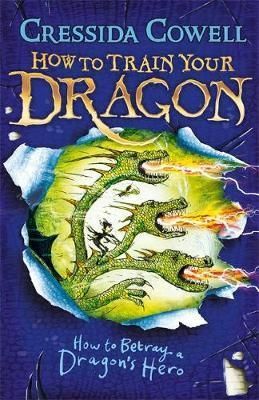 Can Hiccup dodge the dragons and steal the King's Things back from Alvin before the Doomsday of Yule? And is there a traitor in Hiccup's camp who in the end will betray them all? How to Train Your Dragon is now a major DreamWorks franchise. How to Train Your Dragon 2 hits cinemas in Summer 2014 starring Gerard Butler, Cate Blanchett and Jonah Hill and the TV series, Riders of Berk, can be seen on CBeebies and Cartoon Network. Read all of Hiccup's exploits in the series: How to Train Your Dragon, How to Be a Pirate, How to Speak Dragonese, How to Cheat a Dragon's Curse, How to Twist a Dragon's Tale, A Hero's Guide to Deadly Dragons, How to Ride a Dragon's Storm, How to Break a Dragon's Heart, How to Steal a Dragon's Sword, How to Seize a Dragon's Jewel, How to Betray a Dragon's Hero and How to Fight a Dragon's Fury. 'A hilarious and gripping adventure' - The Times Check out the brilliant website at www.howtotrainyourdragonbooks.com It's the place to go for games, downloads, activities and sneak peeks!